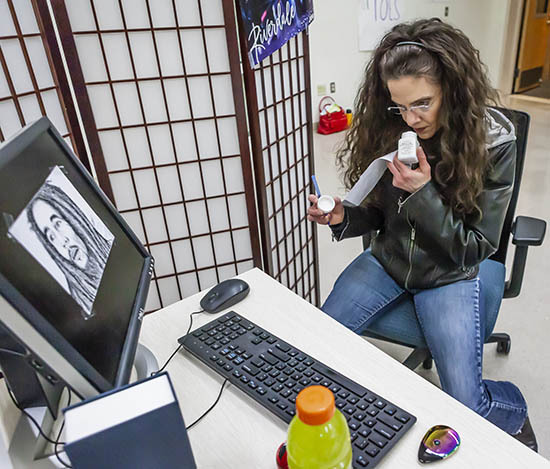 Isabell Loew-Trozzo checks a prescription medication bottle for signs of a substitute opioid in the mock teenage bedroom set at the opioid education event at Glacier Peak High School on Jan. 15. Loew-Trozzo said,”I have a teenage girl at home and I am very thorough." A picture of Bob Marley is taped to the computer screen to suggest a sign of affinity for drug culture. SNOHOMISH — After their kids had all gone home, parents filed into Glacier Peak High School last week to study a topic that might save their teens’ lives. Panelists at a “how to talk to your kids about opioids” presentation shared statistics and stories that showed how serious the stakes are. Regional Medical Center for opioid overdoses. In Snohomish County, 103 people died of overdoses in 2018. Debbie Warfield knew the worst fear of every parent in the room intimately. “My son was one of the statistics,” she told the small crowd. Spencer Warfield was prescribed painkillers at age 5 by a doctor for a dislocated elbow. Years later, Spencer still talked about what a great feeling the drug gave him, Warfield said. He died of a heroin overdose in 2012 at age 24. In a classroom transformed into a teen’s bedroom, parents learned hands-on how to spot drugs and drug paraphernalia. They eyeballed a computer desk, searched through drawers and peeked in a waste bin. But even the most suspicious missed signs of trouble. First, there were items that might show a teen has an affinity for drug culture, such as a T-shirt showing a clock pointing to 4:20 hung over a chair. A pretend screensaver of Bob Marley looked out from a computer screen. Then, there was paraphernalia, from a bent spoon to an herb grinder to a vaporizer. Most surprising to some was not the paraphernalia but the clever ways to hide it. A soda bottle unscrewed to reveal the bottom half was a storage container. A teddy bear with a nearly invisible slit cut into its back was another hiding spot. Special plastic pouches could conceal the scent of marijuana. They saw a vaping device designed to look like a computer mouse. Even a toilet paper roll served a sinister purpose: stuffed with dryer sheets it could act as a filter to absorb the odor of smoked drugs. Everyday items such as eye drops, hand sanitizer and breath mints might also be employed to hide signs of drug use, the panelists explained. The panel urged parents to talk to their kids early and often about drug use. One woman explained she’d started that talk with her 3-year-old daughter, explaining to her it was only safe to take one vitamin and never safe to take anyone else’s. Being open and a good listener is important. Advocating for your children is, too, the panelists said, such as communicating to their doctor if you don’t want them prescribed opioids. And sharing your own history with past drug use could also help create a good dialogue. But talking isn’t going to be enough every time, so parents also learned to spot signs of a drug overdose. They included a slow heartbeat or low blood pressure, slow or shallow breathing, gasping for air while sleeping, pale or bluish skin on a Caucasian person or ashen skin on someone with darker skin. At a health resource fair before the panel, parents could learn where to get and how to administer Naloxone, a nasal spray that counteracts opioid overdoses. All the talk and tools were meaningful to Warfield. The shame around her son’s addiction had initially kept the family quiet. By speaking out, she hoped no parent would go through what she did. The demonstration was a collaborative project by the Snohomish Health District and Snohomish School District.